Now-a-days, most PC makers aim for low price PCs, so they take all possible steps towards squeezing the margin. Is it possible that a better cooler could be installed if they would spend a bit more? Well, this is up to how they position themselves and how they want to serve their customers. For most cases though, assemblers would go for a sleeve bearing fan and a cheap cooler. The case space limits the dimension of heatsink to be small, so in this way peltier element itself plays as a thermal source. This way the heat can not be dissipated. A better solution in this case is to bring out the peltier element, and you might have a better cooling effect. If, the ratio of CPU is higher than how peltier element and heatsink can work together to cool, the peltier element actually bears extra burden keeping CPU at fixed temperature. When its performance is inefficient, it would burn the expensive peltier element since heatsink can't function and then your more expensive CPU will be burned. too. Yes, it's necessary but not fundamental. 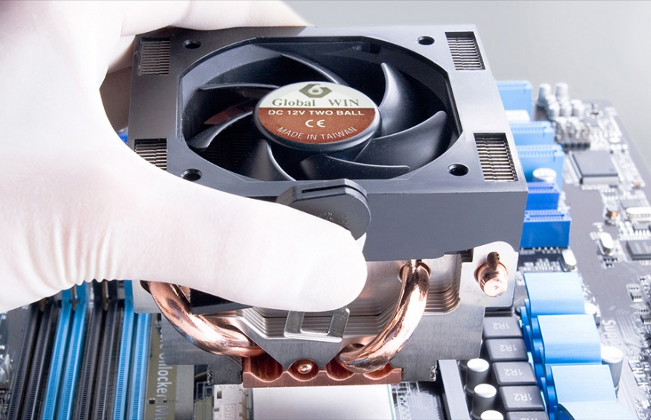 Ideal alarm cooler provides pre-announce function to users before your CPU is getting too hot to shut down PC. So users can store data in advance to suffer nothing from Shutting down and from wasting too much time redoing work or even to replace an expensive CPU when previous one is dead. Logically thinking, if when you replace a good cooler and your PC is again in function, you would know the cooler is the main cause to shut-down. Not necessarily. An ideal cooler consists of good heat dissipation effect and flat bottom surface. Lots of our competitors boost about the necessity of using gap tape is because their product leaves a bit to be desired. However certain customers do require gap tape to assure the total average quality standard of their purchase cooler. In addition, its assembly is faster compared to the use of heat paste. We should say it is designed for lazy person. Are you lazy? You make your decision. Not necessarily. Theoretically heat paste is a help to get better heat contact. However, if you do wrong when assembly, then the use of heat paste would cause you more inconveniences as well as reducing its function. So, what is the right assembly way: the knack is to make sure the heat paste is to be very thin, flat spread averagely and very firmly(-technique required) attach to the bottom surface of your heatsink. There is a potential problem: in the beginning of the use, the effect is indeed better then without, but after one year when the paste is getting hard, it doesn't have the function. On the contrary, it blocks the contact between CPU and heatsink bottom. Result? Incredibly terrible!! When you sell something, would you say it's bad or lousy or poor performance? NO! That's why we bring up this point. Global WIN doesn't say it, we only ask you to have a look at AMD web site or Intel suggested list. If you don't care for more troubles, we shall be pleased offer samples for you to conduct a test. Figures should speak themselves. Also here comes another issue: patent. Not every application of patent will be approved to be issued. For example, our ventsink patent application number is 85202326, and the approval number is 115376. We believe HONESTY IS THE BEST POLICY.